Early spring bee hive inspections give the beekeeper an opportunity to determine the health of the colony and the condition of its queen. Inspections also allow the beekeeper to analyze and start taking corrective action for hive or colony problems. In the inspection, we look at the size of the population of bees and examine the brood. A hive with a smaller population than others being inspected at the same time may have a failing queen. 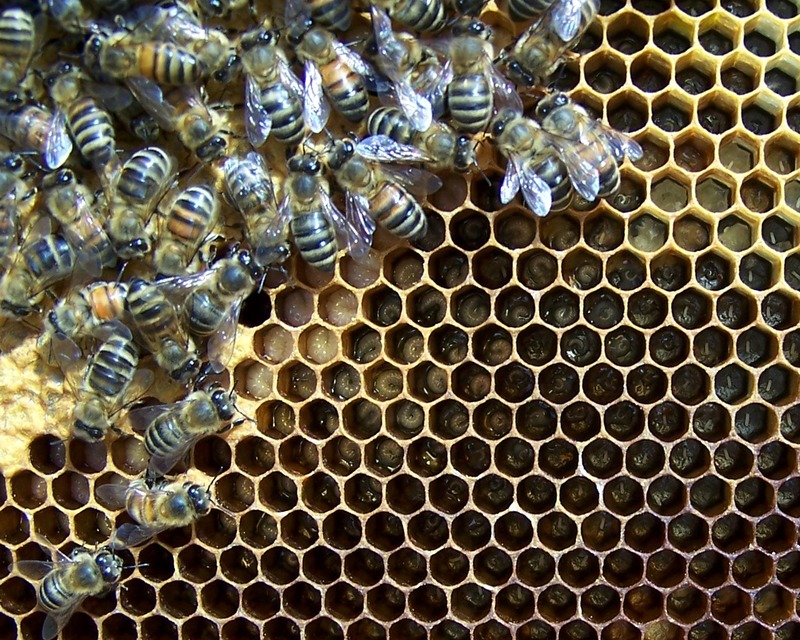 Much can be learned about the queen’s productivity by examining the different stages of brood. Because of the amount of time that the brood remains in each of the different stages of development, we can determine if there is continuity in the queen’s egg laying by roughly counting the brood. When she is laying, there will be twice as many larvae as eggs and twice as many pupae as larvae. For example, finding capped brood but no uncapped brood may mean that the queen has stopped laying eggs. Honey bee eggs and larvae are pearly white in color, and are found in open cells and should not be discolored. Pupae are housed in capped cells, which should have even-shaped cappings made of recycled beeswax. The brood should never have an unpleasant odor. Observing the appearance, texture, and odor of brood can usually identify two serious brood diseases, American foulbrood and European foulbrood. However, there is a very common bee hive condition that is similar in appearance and often tricky to identify. It is chilled brood caused by having a portion of the comb exposed to cold or damp conditions without being covered by protective bees. Chilled brood may have discolored larvae similar to European foulbrood or eneven, discolored, and perforated cappings like American foulbrood. There may be an unpleasant odor as well from decaying bees and brood. The chilled brood and dead bees in today’s photo resulted from vandals exposing a hive to the elements. Knowing the hive’s history helps identify chilled brood. Opening a bee hive engages all of one’s senses. We very quickly learn the condition of the colony within. As soon as we remove the cover of a bee hive, we smell the aroma of beeswax and honey. An unpleasant odor may indicate a brood disease or dead, decaying bees in the hive. Of course, what we see in the hive reveals much about the condition of the colony. We notice the bees’ activity in and around the hive. We find that from hive to hive the bees vary from calm to highly agitated. Some bees remain in the frames, while others fly out in response to opening the hive. The sound of the hive changes with different colony conditions. A queen-right colony with normal activity will generate a gentle humming sound. A queen-less colony will often buzz loudly for a few seconds when the hive is first opened. The beekeeper’s sense of touch comes into play, sometimes unpleasantly. Most bees in the hive’s brood nest will allow the beekeeper to handle the frames of bees bare handed, never stinging unless a bee is accidentally mashed by the beekeeper. The bees from some colonies will punish exposed skin with effective stings. Colonies that readily sting may be queenless; they may be experiencing attacks from skunks or other predators; or they may have inherited defensive behavioral traits. Even gentle bees may sting if the weather conditions are wrong; it is late in the day; or the hive has been opened too frequently. One hive condition seems to always involve my using my sense of taste while examining the hives in the early spring. An unidentified white substance found inside the cells of honeycomb tastes sweet and pleasant; it’s crystallized aster honey from late last fall. As we inspect the bee hive, we always examine the brood. In today’s photo of healthy brood, we see, from right to left, eggs, young larvae, older larvae, pupae in capped cells, and adult worker bees. Warm days in late winter afford an opportunity to make the first in-depth examination of the bee hives. As we approach the vernal equinox and the changing of seasons, we find strong colonies expanding rapidly. 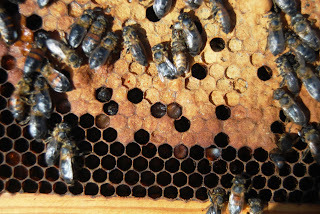 Colonies with a productive queen have large, circular patches of brood on numerous frames. As soon as the pupae emerge as adults, workers immediately clean their cells and prepare them for reused in producing more brood. Drones are walking about the surface of combs of some of the hives, an indication that the bees are preparing for raising new queens. With our hives comprised of three medium-size hive bodies, we typically find that the brood nest now occupies the top two boxes. The lowest hive box is usually empty of bees, brood, and honey; the bees having moved upward during the winter. We can now move this empty box of frames of drawn comb to the top of the brood nest. This move makes available more empty cells for the queen to use for colony build-up, and rearranging the brood nest stimulates the colony to build up an even greater population for nectar gathering and honey production. 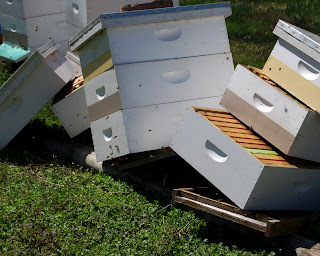 With erratic weather in March, it is important to avoid separating areas of brood production when rearranging the hive. A cold night will often lead to the bees’ covering one brood area and leaving another to chill and die. It is also important when making rearrangements inside the hive at this time of the year to avoid separating the brood from the stored honey. We can even help the bees survive the next few critical weeks of uncertain weather by moving frames of honey and pollen close to the brood nest. 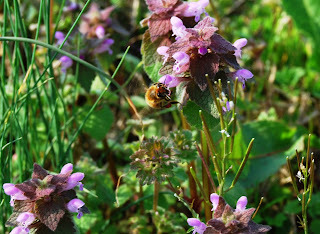 Click on today’s photo to see a honey bee foraging for dead nettle pollen. 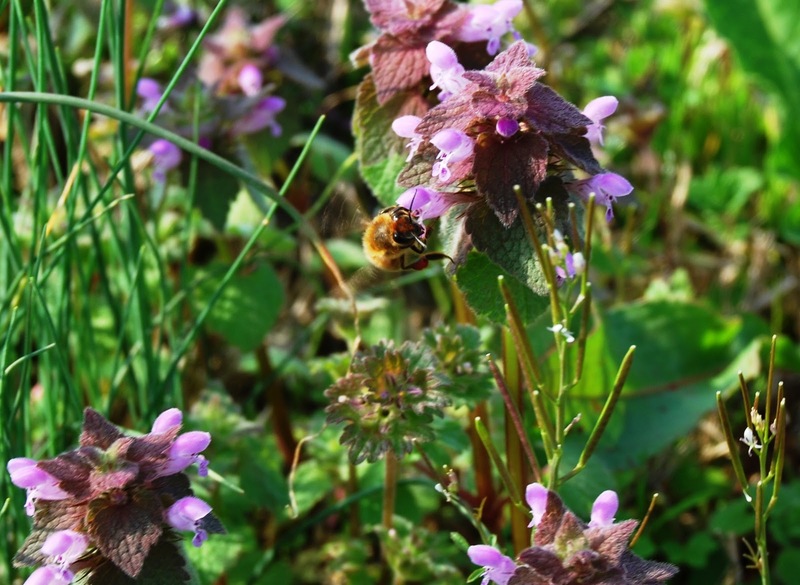 To access this wildflower of the mint family, the forager must learn to place its head under the flower petals that form a hood protecting the flower, an uncomfortable task for the bee. In the temperate regions, the honey bee’s entire life cycle is geared around surviving the winter season when flowers are not producing food. Cold winter temperatures prevent the bees from flying and making cleansing flights. To raise brood, requires greatly warming the brood nest. Because the winter season makes for an interruption in the honey bee’s food supply, the bees must store adequate amounts of honey to feed the colony until flowers bloom again in the spring. While the amount of honey stored in the hive is largely dependent upon the available nectar in the fall and the amount of honey harvested by the beekeeper, it is also affected by the health of the colony. 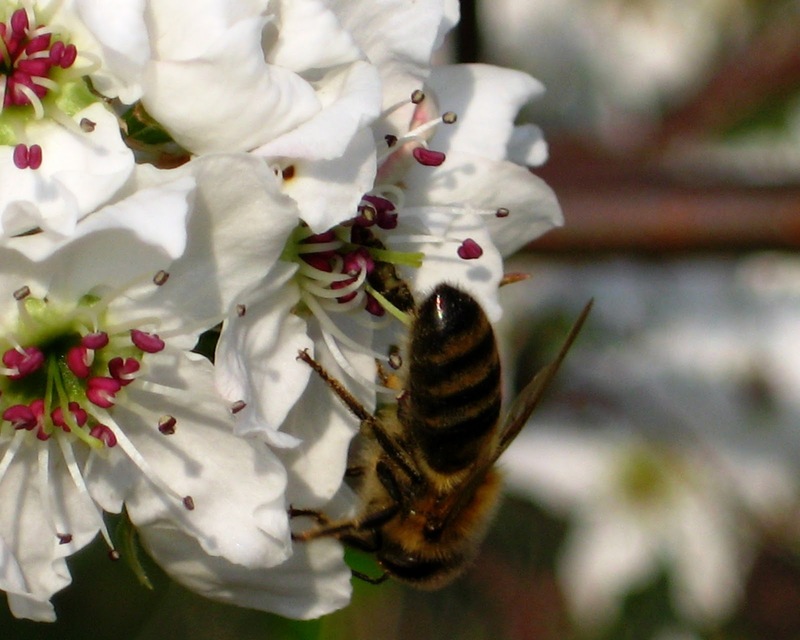 Colonies afflicted by the new strain of Nosema disease have a reduced population of foraging workers, because the disease shortens the bees’ lives. Colonies that survive the winter are likely to be the ones that are not excessively susceptible to pests and pathogens that affect the concentrated cluster of bees. Among these conditions are tracheal mites, Nosema disease, and chalkbrood. Merely surviving the winter is a great measure of the health of the honey bee colony. Harsh winters actually separate the honey bee colonies having beneficial traits and behaviors from those that do not. A late-winter hive inspection finds the brood nest expanding rapidly on strong colonies. Foragers carry pollen of several different colors. A few drones walk about the combs. Pears, flowering trees of the rose family, are in full bloom in the Mid-South. The nectar of the pear contains a lower concentration of sugars than many of the other plants in bloom. Honey bees tend to forage from flowers that offer them the greatest abundance and concentration of sugars. To pollinate pears, beekeepers often move hives into the orchard as the trees start to bloom to encourage the bees to forage the thin sugars of pear nectar. Click on today’s photo of a honey bee collecting caramel-colored pollen from a pear blossom. One of the purposes the honey bee genome sequencing project was to reveal the complexity of the behavior of honey bees as social insects. It was thought that we might learn from the honey bee some of the ways that behavior evolved in human beings. The results of the project, which was completed in 2006, will be studied for years to come. At the same time that honey bee behavior is being studied, psychologists, evolutionary biologists, and anthropologists are comparing the behavior of humans to our relatives from a common ancestor, the chimpanzees. The researchers describe humans’ “cooperative behavior” as opposed to chimpanzees’ “fierce aggression” as being the difference that shaped human evolution. Those who have kept or studied honey bees are aware of the complex behaviors of the bees, especially involving communication, navigation, guarding the hive, protecting from disease, preventing inbreeding, and preparing for seasonal colony events like replacing the queen, swarming, and storing honey. I was interrupted from my reading of an interesting New York Times piece on the behavior of humans and chimpanzees, http://www.nytimes.com/2011/03/11/science/11kin.html?_r=2&hpw, when a neighbor came to tell me vandals had damaged one of my outlying bee yards. Someone had deliberately driven a truck into 10 bee hives, leaving several scattered about the ground and others balanced precariously on damaged stands. The exposed hives contained dead bees and dead, chilled brood. Unprotected, stored honey was removed from the exposed hives by robber bees. Small hive beetles, alerted by alarm pheromone from the damaged hives, flew in from great distances to take advantage of the weakened colonies. Honey bees, social insects, protect their hive with their sting. Beekeepers, social creatures as well, protect their hives by watchful neighbors, deputy sheriffs, prosecutors, laws, and jails. Honey bees confine small hive beetles that invade their hives in propolis “jails.” Eventually, the felony vandals will be caught and confined in real jails. I wonder how far our human behavior has evolved. Troglodytes should not be allowed to drive trucks. The beekeeper’s year is measured by a number of events of the calendar and nature. The calendar is divided into months and days and the solstices and equinoxes. Natural events are also significant to beekeepers. Among them are the bloom of the red maple, clover, blackberry, apple, tuliptree, and goldenrod. The bloom dates of major nectar producers, like soybeans and cotton in the Arkansas Delta, are also carefully followed. 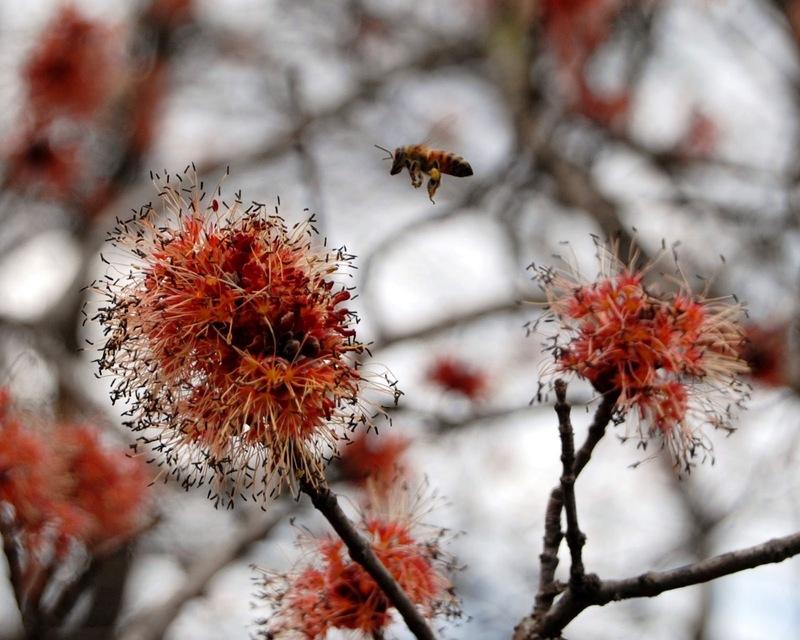 The red maple bloom is one of the first events observed by beekeepers. Maples are often the first major source of nectar and pollen. Red maple trees produce considerable nectar and large amounts of pollen in the late winter. As foraging workers bring the red maple pollen into the hive, it stimulates the queen’s egg production. The pollen also provides necessary protein for the developing brood. In the Arkansas Delta, the red nectar bloom occurs during the rapid expansion of the honey bees' brood nest. The red maple is followed in bloom by the silver maple, sugar maple, and the box elder, which is also a maple. Maple honey is described as having a fine flavor and a white or amber color with a tinge of pink. Rarely is a surplus stored; most is consumed feeding the brood. Elms are wind-pollinated trees, but honey bees collect pollen from elms during times of pollen scarcity from other sources. The American elm was planted extensively in urban areas; but its numbers were reduced by a fungal condition, Dutch elm disease. Today, the most common elm is a small tree, the winged elm. While the maples and elms bloom at an important time in the early development of the honey bee colony’s spring-time expansion, their bounty is often missed. Cold and rainy days of the late winter and early spring often prevent bees from flying while the trees are in bloom. The weather was warm and pleasant today, and I saw foragers bringing in bright red maple pollen. Today’s photo: red maple in bloom. The earth’s population is predicted to reach nine billion by 2050 with increasing demand for food, water, fuel, and arable land. Industrial agriculture that dominates food production today is highly dependent upon chemicals and fossil fuel for crop production and transportation. Industrial agriculture typically employs large-scale plantings of a single species of a genetically modified crop, heavy tilling equipment, chemical fertilizers, herbicides, and pesticides, plus large amounts of irrigation water. Mark Bittman, writing today in The New York Times, suggests that another model of crop production more closely resembling organic farming may be a better solution for feeding the world. 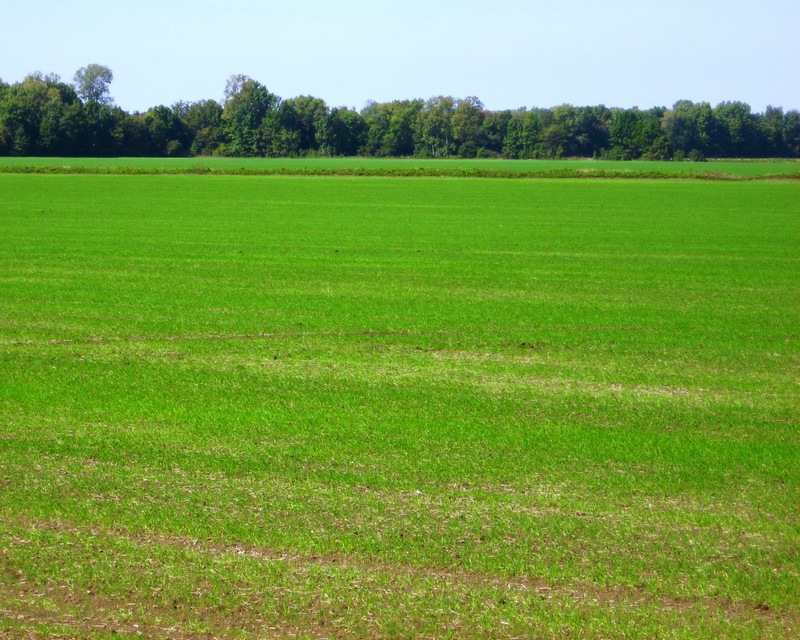 Organic practices rely less upon chemical fertilizers, herbicides, and pesticides. A blended model of farming employing the best practices of both industrial and organic agriculture may be a sustainable alternative. See http://opinionator.blogs.nytimes.com/2011/03/08/sustainable-farming/?src=me&ref=homepage as well as Andrew Revkin’s analysis at http://dotearth.blogs.nytimes.com/2011/03/03/a-hybrid-path-to-feeding-9-billion-on-a-still-green-planet/. Those skeptical of elements of industrial agriculture, like the use of GMOs or genetically modified organisms, must be willing to accept the reality of the safe use of GMO foods over a number of years. Also, GMO crop planting allows for reductions in insecticide usage and increased use of no-till farming practices. Likewise, producers growing crops under industrial conditions must realize that the large-scale planting of mono-cultural crops, heavy use of chemical herbicides and pesticides, and elimination of “turn-rows” or crop margins has added to the serious decline of beneficial insect pollinators. The loss of honey bees and other pollinators adversely affects all agricultural growers. Just as a blended model of crop production may prove to be a more sustainable design for the future, a blended model of integrated pest management may be the best choice for managing honey bee colonies. The repeated use of bee hive chemicals designed to kill parasitic mites and suppress American foulbrood resulted in resistant strains of mites and bacteria. The complete abandonment of bee hive mite chemicals is not successful except with bees bred for genetic mite resistance. 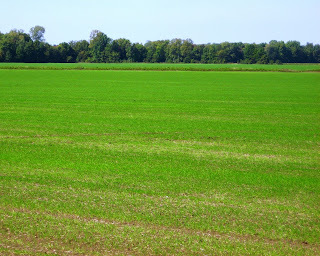 Today’s photo: industrial agriculture: mono-cultural winter wheat. 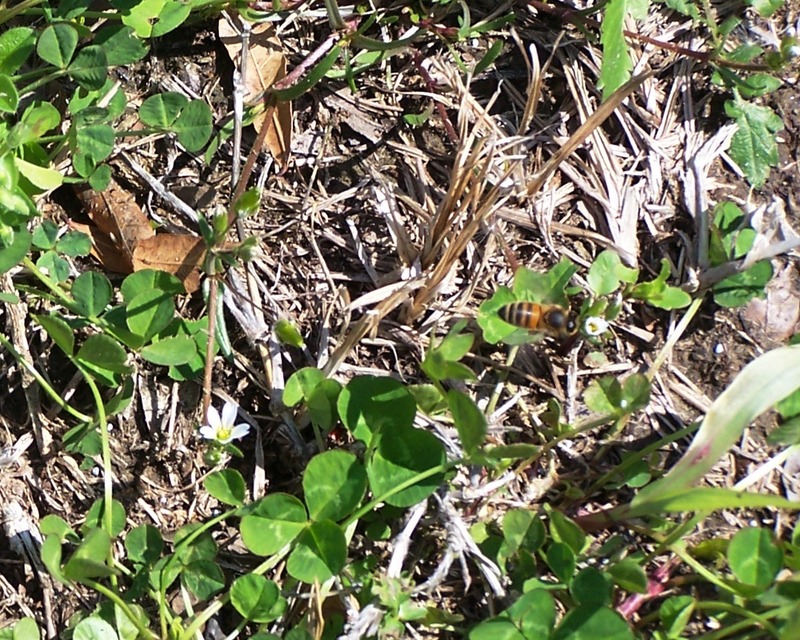 We can learn much about honey bees by observing bees in their natural habitat. Residents of my Arkansas Delta county called today and described a colony of honey bees living in a huge, hollow cottonwood tree at their home. Cottonwoods are among the tallest trees in the Delta, climbing to nearly 150 feet. This gnarled tree had weathered many a season and showed the damage of numerous wind storms and lightning strikes. Hollow cavities in storm-damaged trees provide excellent spaces for honey bees to build their nests. The colony moved into the ancient tree this past October. Colonies that swarm late in the year often fail to build enough comb and store a sufficient amount of honey to survive the winter. Fortunately, there was a good nectar flow from goldenrod this past fall. If you click on today’s photo, you can see the entrance to the natural honey bee nest about 23 feet above ground on the underside of a large, hollow limb. 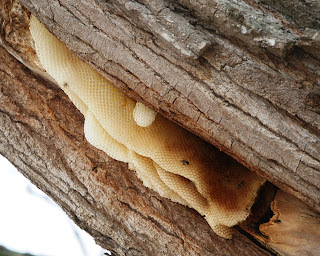 Four sheets of clean, light-colored beeswax honeycomb hang down from the opening in the tree. 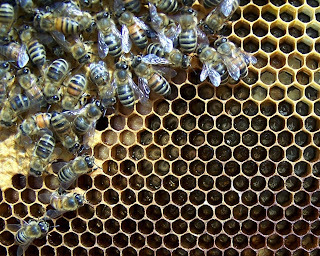 The darkened comb previously held brood and pollen. Like a screened bottom board on a modern bee hive, the open bottom of this natural nest allows hive debris and parasitic Varroa mites preened by the bees to fall to the ground. All of the exposed comb is empty; the bees have moved their cluster upward over the winter. The empty cells filled with air make excellent insulation for the colony’s nest. The sheets of comb themselves help calm the winter winds. The homeowner and I watched the honey bees actively flying from their natural nest. An international pilot, he discussed how insecticides are sprayed inside the cargo holds of aircrafts before landing in foreign countries to prevent the unwanted transfer of bees or other insects. This colony should be successful in its new home. It found a suitable tree and a family concerned with protecting the bees and the environment. The plum is the first white-blooming tree seen in the woods early in the year. Plums blossoms have just started showing in the Mid-South. Plums can be seen in large thickets and scattered among the understory of forests. In the next few weeks some stands of plum in full bloom will give the woods the appearance of a late winter snowfall. Their locations often reveal pioneer homesteads long abandoned. When one encounters plums, pecans, mimosa, sassafras, yucca, forsythia, daffodil, catalpa, or wisteria in the woods, bricks and rubble of earlier dwellings are usually close by. We often find a number of varieties of plums in a woodlot, forest margin, or abandoned farmstead. Along with wild plums one may find Chickasaw plums, thought to have been cultivated by the Chickasaw Indians and early settlers. 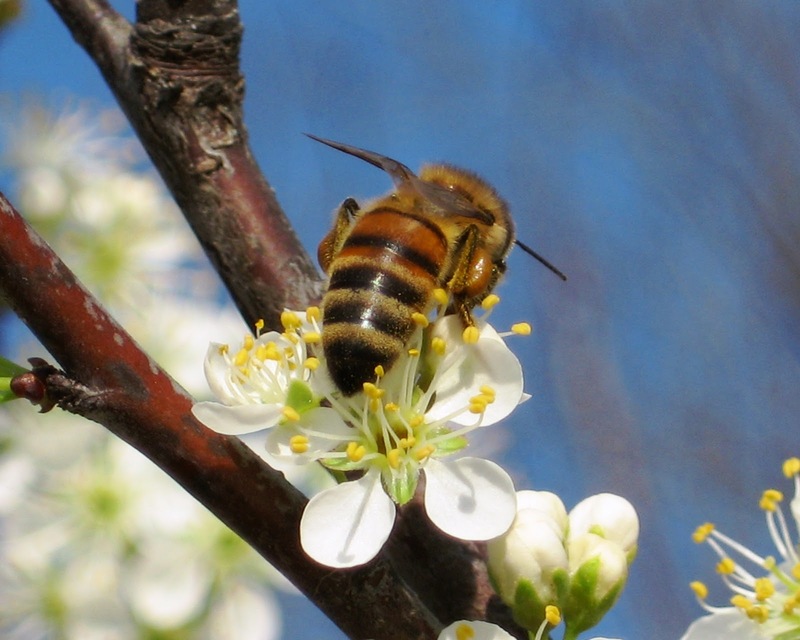 Many domestic plums require pollination by honey bees or bumblebees to produce fruit. Wild animals attracted to the fruit scatter plum seeds. In today’s photo, an aging forager gathers pollen from a plum blossom. The old worker bee, a survivor of the winter, has lost much of the hair from her abdomen, giving her a black, shiny appearance. The bee clings onto the plum flower using the pads and hooks of her feet. Using body attachments shaped like combs and rakes, the worker preens the pollen granules from her hairy body, into pellets of gray-colored pollen to be carried on her hind legs. The arrival of pollen being brought into the hive in late winter serves to stimulate the queen to increase egg laying. Plums provide valuable nectar and pollen early in the year when it is most needed for winter survival and for starting the colony’s population build-up for the spring. The plum is a member of the important family of bee plants, the roses. Other roses include California’s almonds and other fruit trees: pears, peaches, cherries, and apples. Hawthorns, blackberries, strawberries, and greenbrier are also roses. The bees and beekeepers welcome the plums in bloom. The calendar tells us that three more weeks of winter remain. We declare that spring begins on the day of the vernal equinox. However the change in seasons progresses at about one week for each 100 miles of latitude. The weather warmed today and allowed the bees to fly. 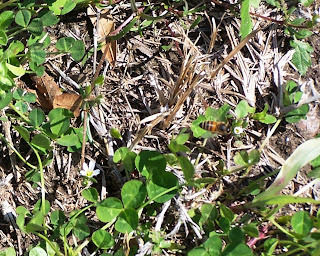 I noticed foragers working the tiny white flowers of sand wort blooming among clover leaves starting to unfold in the winter-bare ground. Other foragers were forcing open a single petal of crabapple flower buds today to access nectar or pollen. Tomorrow the blossoms should be more open. With warm weather forecast for tomorrow, the foragers will return to the same flowers. Red maple flowers are opening, but not yet attracting bees. The trees must not be producing nectar and pollen at this time. Similar flights were made a month ago 400 miles to the south where many of the queen bees are produced. A beekeeping friend in New England now covered in deep snow won’t see flowers for weeks to come. In the Arkansas Delta, March is the harshest month for the honey bee colony. While a few flowering plants are just starting to bloom, there is no significant nectar flow. Brood production is well underway, and considerable amounts of food are needed for the developing bees. With brood present, the hive’s brood area must be maintained at 95 degrees. The honey and pollen stores are dwindling in the hives. Some of the food for the brood is held in the tissue of fat bodies and glands of the worker bees themselves. The quality of this food follows the health of the bees from the time they emerged as adults last October. Meanwhile, the colonies are growing and consuming increasing amounts of food. March’s rapidly changing weather patterns bring both cold and warm days. The bees consume much energy on warm days like today searching for food; often more energy is spent than is gained in foraging. Most starvation occurs in March.